Last year Tesla announced the Powerwall, a smart home battery mainly aimed at storing the energy from your renewables to use when the sun isn’t shining or the wind isn’t blowing. Last week, in the early hours of Friday morning UK time, the third part of the trilogy was unveiled as they launched their volume ‘affordable’ electric car, the Tesla Model 3. Over 100,000 people put down a $1,000 / £1,000 (refundable) deposit to reserve a spot in the Model 3 queue, before they had seen the car, heard the performance details or even the price. This afternoon, less than a week later that number has risen to 325,000. Clearly Tesla are on to something here. It’s two and a half years since I first drove an electric car. Back then I wrote this.. I still love fast cars, but that run in the i3 was quite an eye opener. It was clear that the performance of the new generation of electric cars was going to be quite a bit different to something like the G-Wiz. That instant torque thrill of an electric car is often talked about and it’s impressive. The base Model 3 will accelerate like a Golf GTI (0-60 in under 6 seconds) and there will be much faster versions available (the fastest Model S does 0-60 in 2.8 seconds seeing off all but the most exotic of hyper-cars). Range anxiety should be put to bed for most with a 215 mile battery for the base model – more than double the range of most all-electric cars on the market. There’s lots of data around for the US and UK regarding the length of our car journeys. It’s probably fair to distil them down to the following: 98% are less than 50 miles and the average commute is less than 20 miles. In any case Tesla are doubling their supercharger and destination charger network in the next 12 months. And they’ll need to continue at that rate if they are going to serve the hundreds of thousands of new electric cars that are coming. Model 3 prices start at $35,000. That may well equate to £35,000 by the time it reaches these shores though. That’s around the price of a nicely spec’d Golf GTI, although that’s only the base model remember. Musk has said the average customer will spend an additional $7,000 on options. With the current Model S for example turning on the ‘Autopilot Convenience Features’ costs £2,200 and adding the Dual motor (4 wheel drive) option costs an additional £4,400. The government grant for buying an EV recently fell from £5,000 to £4,500 and who knows how much it will be by the time the cars arrive in the UK. The UK’s right hand drive models will the the 3rd of 4 stages of production, making it unlikely we’ll see them here before 2019. Driving an electric car doesn’t suddenly mean we’re all off the hook. Some of that electricity running the cars will be produced by dirty coal fired power stations for example. The electricity used in EVs will get cleaner over time though. The UK should increase from around 15% renewables today to over 30% by 2020 for example. (If you want more infotainment on electric cars I can highly recommend Robert Llewellyn’s Fully Charged Show on YouTube). I remember the first time I picked up the iPhone, I landed in Florida for a holiday the day after it was launched in 2007. I told the guys in our IRC channel that it was game changer (some mocked and told me it wouldn’t make a dent on Blackberry’s business – who’s laughing now). Teslas give me that same feeling of being years ahead of the competition. Last week at the Gadget Show Live I had my first brief experience in one. We were passengers in a Model S and on the test drive we were shown some of the autopilot features (check out the video above). The automatic safety features, self-parking and OTA software updates all seem so obvious to anyone with more than a passing interest in technology (you dear reader) and make the Telsa the 21st century car many of us are looking for. 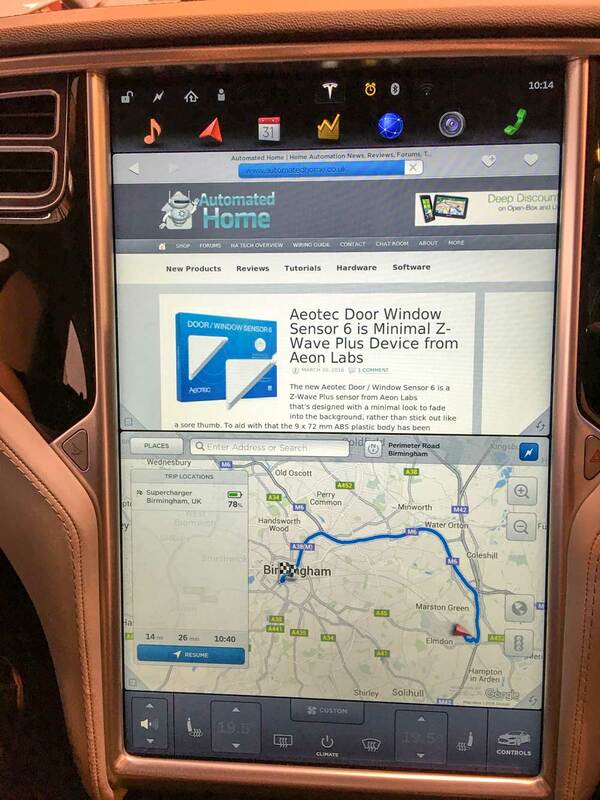 The 17″ portrait touchscreen of the Model S (below) will be replaced with a 15″ landscape on in the Model 3. The interior of the new car is one of the main talking points, with its lack of instrument binnacle behind the steering wheel leading many to believe Musk will unveil a HUD or similar device at the second part of the cars reveal sometime between now and its release. So could you see the M.3 being your only car? If you are a two car family could you perhaps see it being your second car? I have friends that run a BMW i3 and an electric motorbike and so are completely EV’d up – so it’s certainly possible for some, perhaps many of us? Is this the tipping point for the electric car? It certainly feels like it’s the beginning of something that means more of us will have to compromise far less than we thought to own an electric car. Elon Musk’s entire Model 3 reveal is only 20 minutes long and well worth a watch. 1 Comment on "Opinion: Is the Tesla Model 3 the Tipping Point for the EV"
The OTA software updates are a stark illustration of the ancestory of Tesla Motors, compare their OTA updates to issue new features & better performance to Volkwagon’s product recall to fix a flaw in the battery management software.